Yeh Un Dinon Ki Baat Hai – The show based on the 90s saga has always been a romantic story since the beginning. The love story of Sameer and Naina aka Samaina has travelled through a long route from their school days to college and now finally they are a married couple. Throughout the story they had all sorts of moments between them but their intimacy had always been very sweetly subtle. They were bold with their approach but never visually considering the era the show concentrates on. But since the couple is married now, some sort of boldness is of course awaited by the viewers. And Sony Entertainment Television is making sure to keep the viewers on their toes fulfilling their expectations. Sameer and Naina are going to get bold now visually on screen as well. 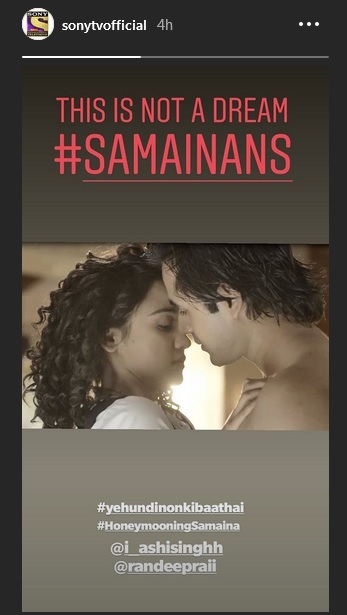 Sony TV has recently shared an Instagram story that shows Naina and Sameer getting intimate and they have assured the viewers about it not being a dream. This would surely cheer up the Samaina fans and get them hooked to the screen. Take a look at the picture below and let us know if you are in hyperventilation mode. DON'T MISS - Zain Imam, Sanaya Irani, Karan Tacker, Mohit Sehgal, Drashti Dhami In One Frame!